« There’s never been a better time to join Stampin’ Up! 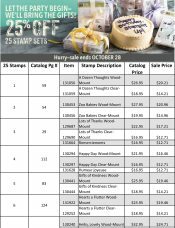 Twenty five stamp sets at 25% off ? Now that’s a special! As yet another part of Stampin’ Up’s! 25th birthday celebrations twenty five stamp sets have now been placed on a special of 25% off! Now that’s a bargain. Is there a girl alive that doesn’t love a bargain? Want to see what’s available at this great basement bargain price? Call me to place your order this special is for a limit time and ends on 28th October, so don’t delay.